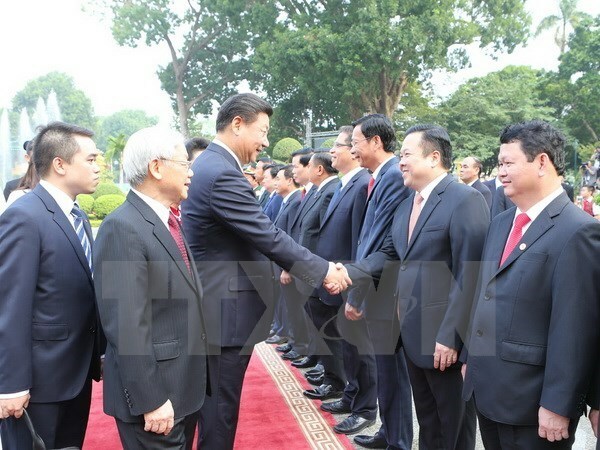 Vietnam and China inked a number of cooperation documents and agreements in Hanoi on November 5 in the presence of Vietnamese Party General Secretary Nguyen Phu Trong and Party General Secretary and President of China Xi Jinping. The documents include a cooperation plan on training personnel of the Communist Party of Vietnam and the Communist Party of China from 2016-2020. The Vietnamese and Chinese Governments signed an agreement on the travel of vessels in the free navigation area at the mouth of the Bac Luan/Beilun River, a cooperation agreement on protecting and tapping tourism resources of Ban Gioc/Detian Waterfall, and an agreement on the establishment of a Vietnamese cultural centre in China and vice versa. The Governments also exchanged a diplomatic note on China’s sending of a group of experts to Vietnam to survey the planning of a standard gauge railway route linking Vietnam’s Lao Cai province, Hanoi and Hai Phong city. While Vietnam’s Ministry of Industry and Trade and China’s National Development and Reform Commission signed a memorandum of understanding (MoU) on boosting production capacity cooperation, an MoU on the optimisation of the design of the Vietnam-China Friendship Palace project was reached between the Vietnamese Ministry of Planning and Investment and the Chinese Ministry of Commerce. The Quang Ninh provincial Party Committee and the Guangxi Zhuang Autonomous Regional Party Committee reached an agreement on holding friendship exchanges between their local Party units. A similar document was also signed by the Lao Cai provincial Party Committee and the Yunnan provincial Party Committee. An MoU on infrastructure cooperation was inked between the Vietnamese Ministry of Planning and Investment and the Export-Import Bank of China. Also on November 5, the China Development Bank signed a contract to provide a 200 million USD loan for the Joint Stock Commercial Bank for Investment and Development of Vietnam. An MoU on capital provision for thermal power plant projects was inked between the Vietnam National Coal – Mineral Industries Group and the China Development Bank, which also reached another MoU on investment and financial arrangements for the Build-Operate-Transfer thermal power plant project Vinh Tan 3 with Vietnam’s Vinh Tan 3 Energy Joint Stock Company.